Home » Socio-cultural Anthropology » Anthropology of Religion: Christian Tradition » Who were the post-Wycliffe Lollards, what did they practice and what became of their movement? Critical to religious reformation, I will argue that the post-Wycliffe Lollards suffered from a lack of intellectual leadership, as well as ecclesiastical and secular persecution which forced the movement into secrecy, pushing Lollardy to the fringes of religious society and effectively neutering its ability to facilitate Church reform-dooming them to extinction as a distinct religious sect. From its inception in Oxford c.1380, Lollardy and its origins are attributed to John Wycliffe. Nurtured by Wycliffe writings, Lollardy quickly spread beyond the confines of Oxford University into the surrounding southern half of England. Forced out of Oxford in 1410 by archbishop Arundel's persecutions, Lollardy was driven into hiding or exile throughout England. This was further exacerbated by Sir John Oldcastle's failed Lollard revolt of 1414. By the 1430's, Lollardy had moved underground with occasional manifestations in the 1490's and early sixteenth century. Lollardy passed away quietly in the sixteenth century giving way to Protestantism (Hudson 1988:1). This paper examines Lollardy, post 1414, in medieval England and seeks to answer who were these post-Wycliffe Lollards, what did Lollards believe and practice and what happened to their movement. Critical to religious reformation, I will argue that the post-Wycliffe Lollards suffered from a lack of intellectual leadership, as well as ecclesiastical and secular persecution which forced the movement into secrecy, pushing Lollardy to the fringes of religious society and effectively neutering its ability to facilitate Church reform-dooming them to extinction as a distinct religious sect. From its beginning and throughout its history, Lollardy was a theological movement. This is validated by sources, such as the writings of Wycliffe, Lollard texts and records from ecclesiastical and secular authorities (Aston 1984:2). The term "Lollard" was first used in 1382 by Henry Crumpe, who was suspended from Oxford University for referring to Wycliffe and his followers as Lollards. Furthermore, the term "Lollard" can be found in official proclamations and records, and refers to Wycliffites from both Oxford and afar. From 1385 to 1450, the term "Lollard" was used pejoratively and was received by those to whom it applied with great disdain. After 1450, the term "Lollard" was redefined as a proud term signifying those to whom it applied as "true Christians (Hudson.1988:3). Who were the later Lollards and what did they believe and practice? The Lollards considered themselves a sect, as did ecclesiastical and secular authorities, even though Lollard beliefs varied somewhat from group to group and even from individual to individual within the same Lollard group (Thomson 1965:240). Rather than a specific creed of well thought out theological doctrine, Lollard beliefs are more aptly described as a set of consistent attitudes (Thomson 1965:239). Lollardy was strongly associated with the use of English language in religion. Lollardy embraced both a scriptural fundamentalism and a common-sense rationalism (Thomson 1965:244). This attitude coupled with the Lollards enthusiasm to read scripture in the vernacular, lead the Lollards to discovering a host of errors from the Bible, as it pertained to the orthodoxy. Not only did the Lollard's individual interpretation of scripture change doctrine, they also changed its method from priestly intermediaries to a laity of advocates of Christ, where religious authority was vested in scripture and preaching the word (Aston 1984:13). The Lollards were zealous in acquiring and trading vernacular religious material, particularly scriptures. This was central to the core of Lollard practices-access to religious knowledge-the word of God as written in the Christian Bible (McSheffrey 2005:61). 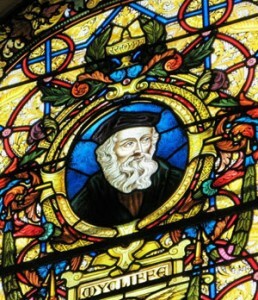 Lollard beliefs and attitudes can be traced back to the writings of Wycliffe, although in some instances Wycliffe's position appeared more moderate. The Lollards of the mid to late fifteenth century knew of Wycliffe and used his writings for direction and inspiration, but their beliefs seemed only loosely based on Wycliffite doctrine (Thomson 1965:240). Hersey trial records of charges against suspected Lollards reveal broad range of categories of core attitudes and beliefs, including: rejection of venerating images and saints, pilgrimages, swearing oaths, fasting and abstinence, special days, tithes and church fees for clergy. Lollardy was also known for its unorthodox statements on the sacraments of baptism, confession, marriage, the Eucharist and confirmation (Somerset 2003:70). First and foremost, Lollard attitudes were anti-authoritarian and anti-papal, and the writings of Wycliffe succinctly stated this attitude, "That the Pope is not the vicar of Christ, nor of Peter" (Todd 1842:1). "The pope, cardinals, bishops, and other prelates beneath are disciples of Antichrist and sellers of merit" (Todd 1842:53) and, "That the Pope selleth indulgence. That he may give no indulgence, neither to men in purgatory, nor to hem that are prescit, that is to say, that are to be damned, or are now damned" (Todd 1842:7). Another Lollard doctrinal favourite states, "Iche prest is holdun to preche" (Todd 1842:30). This meant that it was the duty of all priest to preach without the necessity of a license from a bishop, even if in opposition to a bishop's objection (Todd 1842:xxix). Lollards were also known for denying transubstantiation in the sacrament of the Eucharist, "That in the sacrament of the alter, after consecration, dwelleth the substance of the bread" (Todd 1842:45). The basic rationale held by Lollards declared material bread remained bread even after the spoken words of consecration. A Lollard analogy argued that a priest could not make God who first made him no more than a house could make a carpenter (Thomson 1965:246). Lollards also accused the church of abuses and trading in sacred things and were known for their unwillingness to pay Church dues, describing the Church as a synagogue-a place of thieves and merchandise. Furthermore, Lollards expressed anti-clerical views with respect to Eucharist sacrament, comparing priests with Judas, for demanding offerings prior to communion-denoting that the priest had literally sold Christ (Thomson 1965:247). The rejection of saints and pilgrimages was another common facet of Lollardy. "Images of the saints are not to be worshiped" (Todd 1842:85). This tenet, based on scripture, prohibited the use of religious images as objects of worship-substitutes for God. Lollards believed that the veneration of images, including the cross of Christ, and pilgrimages to shrines was idolatry. Lollards argued that idolatry created false beliefs such as God, the Holy Spirit or angels have bodily forms (Aston 1984:139). Recorded incidents of iconoclasm by Lollards were scare, but they did happen. The preferred method of idol destruction was burning as mentioned in scripture, Deuteronomy 7:5, "burn graven images with fire". Lollards thought all religious images were nothing more than "stocks and stones" (Thomson: 1965:148). Furthermore, the Lollards thought that burning wooden carvings of saints made great firewood to warm the poor, and also disproved their miraculous powers to bleed (Aston: 1984:170). Lollard doctrine of idolatry also stated, "churches are not to be worshiped, nore sergs candles, tapers to be multiplied therein" (Todd 1842:48), "that the written Gospel is not to be worshiped" (Todd 1842:90), and "that charms is no manner are lawful...that it is superstitious to hand words at the neck" (Todd 1842:92). Other Lollard beliefs included the rejection religious oaths, "That the vow of religion is against Christ's Gospel" (Todd: 1842:100), citing Matthew 5:37, "to go no further than 'yea, yea, nay, nay' (Aston: 1984:111) The Lollards also asserted "that it is not lawful for the religious to beg" (Todd: 1842:108). Lollards were also known to reject fasting and in defiance of this church rule, they would eat meat at forbidden times of the year almost as a secret rite (Aston 1984: 93). Lollards were loosely connected to one another, forming small groups of three or four and usually no more than ten as indicated by the Coventry Lollards. Furthermore, Lollards tended to be isolationists, only vaguely aware of other Lollards in other towns and cities (McSheffrey 77). Lollard recruitment was restricted to social interaction, such as familial relationships and neighbourly connections, as well as economic associations through workplace, trade and commerce (McSheffrey 2005:75). The social distribution of later Lollardy attracted mostly middle levels of social structure. Few were labourers, priests, urban elites and minor gentry (Rex 2002:102). Not all Lollards were literate, but those who could read were usually artisans, such as weavers, tailors, carpenters, butchers, millers, wire-drawers, tanners, shoemakers, etc. (Hudson 1988:130). Most Lollards shared a general contempt for the pomp and formal ceremony of orthodoxy and preferred private devotion (Aston 1984:137). Lollard teachings from the late 1420s to the early sixteenth century characteristically took place in an informal and social context (Rex 2002:110). This was largely because Lollardy was being aggressively sought out and prosecuted by both ecclesiastical and secular authorities. Later Lollards were relegated to secretly reading and listening to vernacular scriptures and discreetly spreading heretical doctrine (Thomson 1965:6). Lollard gatherings were typified by a man or a woman reading scripture aloud followed by a discussion concerning contrary doctrines or practices by the orthodoxy (McSheffrey 2005:68). The Lollards of Coventry were know to read a passage from the Gospel Luke 12:32-3 about giving alms to the poor, followed by discussions of its virtue versus making offerings to the Catholic shrines. Lollards were also known to cite the Ten Commandments as rebuttal to pilgrimages and venerating saints (McSheffrey 2005: 68). Lollards were known to meet in secret night places, such as fields and hedges for underground English Bible reading parties. In the early sixteenth century, in Hampshire, Thomas Watts was discovered by authorities reading the English New Testament to his wife and family and five other persons who were later accused (Aston 1984:199). Coventry Lollards were noted in 1511-12 to have learned their doctrines from heretical texts handed down through the family, illustrating the importance of the household in Lollard society (Aston 1984:203). Lollard women also took an active role in Lollardy. It was common for husbands to convert their wives to Lollardy. There were also cases where wives converted their husbands to Lollardy, but in these cases, the wife probably acquired their Lollard teachings from her parents or masters. Lollard mothers were instrumental in teaching their children vernacular prayers, favourite Lollard passages from scripture, as well as heretical Lollard tenets. (Rex 2002:106). What happened to the Lollards? If Lollardy was to have a future it would require significant support from the English gentry and the Court. Wycliffe had such support and it was probably the lordship of John of Gaunt that protected him from the full wrath of the orthodoxy for his teachings in the late 1380s. Furthermore, the Lollard Knights, who were an important gentry component to early Lollardy, were also well connected with the Court (Rex 2002:71). But, as history shows, Lollardy failed in this respect. Wycliffe underestimated the vast sway of the friars over the English gentry and his intellectual confrontations did not damage their reputation or role with the English elite. By the late 1420s, Lollards had disappeared completely from Oxford University, the intellectual center of Lollardy. This was facilitated by the implementation Arundel's Constitutions and the burning of William Taylor in 1423, turning Lollardy into a life-threatening religious choice and effectively severing Lollardy's academic head (Rex 2002:89). Furthermore, any remnants of Lollard appeal to the English gentry evaporated with the heresy conviction of the Lollard Knight, Sir John Oldcastle for heresy. What leadership and organizational structure the Lollards had achieved at this point evaporated with Oldcastle's failed Lollard rebellion of 1414, leaving the Lollards less of a cohesive sect and more of a loose network of anti-clerical sympathizers (Rex 2002:81). Lollardy, now synonymous with heresy, were sought after by both ecclesiastical and secular authorities. In 1414 Parliament passed "the Merciless Statue", which stated that anyone convicted of heresy would have to forfeit all possessions, and an oath administered to the Lord Chancellor to all magistrates to quash "all heresies, errors and Lollardies" (Summers 1906:56). After the Oldcastle rising of 1414, those Lollards who had not been killed or executed faced three choices: 1) Submit to the church orthodoxy and receive a Royal Pardon and return to the fold; 2) Follow their heretical beliefs and practices in secret or live as fugitives; or 3) remain obstinate and seek to overthrow their persecutors in any way possible (Thomson: 1965:6). Lollardy was now more concerned with self-preservation than social revolution. Many recanted and some were executed by burning at the stake. From 1414 to 1522, the records of major heresy prosecutions by Bishops showed there were 392 abjurations, 15 purgations, 102 indictments, arrests or accusations and 33 executions or burnings (Thomson 1965:237-238). By 1431, the aggressive force of Lollardy was all but spent. The loss of Oxford and the deaths or recantations of its leaders had obliterated its political and academic influence. Lollardy failure to attract the gentry and the clergy seriously hampered its efforts on social expansion (Rex 2002:101). From 1431 and into the sixteen century, the spread of Lollardy would succumb to a slower and quieter means of recruiting converts-peripatetic preachers were replaced with peripatetic readers and large open gatherings for preaching the Word were replaced with secret meetings. (Summers 1906:56-60). Statistical heresy records suggests a revival of Lollardy in the 1490s. There was marked increase in Lollard persecutions and abjurations as well as many Lollard burnings from 1485 to 1536. However, statistical data doesn't reveal whether Lollardy was growing in numbers or if it was just better record keeping on the part of the authorities or perhaps the authorities were simply more aggressive in searching out and prosecuting Lollards (Rex 2002:113). Furthermore, there is no evidence of any new Lollard texts after 1485, nor the printing of any older Lollard doctrine until later in the Reformation. Other than an increase in Lollard numbers in the heresy prosecutions records, there was no expansion of Lollardy into new areas, no academic or clerical leadership, no Lollard recruitment in the upper class of society, nor any political patronage or support. In short, Lollardy displayed a contrary profile of a reviving evangelical movement (Rex 2002: 114). What became of the Lollards when the Protestant Reformation came to England? Did the Lollards convert to Protestantism? Evidence shows that converts to Protestantism were largely of devout Catholic backgrounds and not that of Lollardy (Rex 2002:119). Modern studies of minority religious sects provide an analogous model for understanding the fate of later Lollardy. Some toyed with Lollardy, but were easily frightened off by threat of prosecution. There were those who were dedicated to their beliefs, even to the death as attested by those burned at the stake, but the vast majority of later Lollards, unlike the Protestants, were not evangelical. They preferred to quietly hold true to their beliefs while externally being conformist in public and participating in orthodox services (McSheffrey 2005:76). Many Lollards survived undetected by continuing to participate publically in the mass and receive communion. This they reasoned was a spiritual benefit, while maintaining mental reservations about the orthodox doctrine (Thomson 1965:247). The later Lollards were so outwardly conformist that there is no evidence of copying of Lollard texts nor any new writings on the theological and social issues of the day. The later Lollards were so non-involved that they, as a sect or group, were in a state of decay, verging on intellectual and moral bankruptcy (Rex 2002:132). With the advent of the English Reformation, the Lollards were unlikely to recant and become Roman Catholics. Now that their dissident beliefs were being vindicated and the new Church of England eliminated the mass, veneration of saints and pilgrimages, auricular confession and the authority of the papacy, Lollardy faded into the background. The parallel doctrines of Lollardy and Protestantism converged ceasing to be distinctive (Rex 2002:140). Interestingly, by the middle of the sixteenth century, Protestant reformers were reprinting Lollard works for English readers. Lollardy as an indigenous vernacular movement provided heretical literature for later Protestant advocates to disseminate Lollard arguments to a wider audience through the medium of print (Aston 1984:135). It seemed that Protestant reformers were using Lollard manuscripts for the purpose of assisting the Reformation in its formative years (Aston 1984:232). It could be inferred that a number of Lollard texts, other than Bible translations, were in circulation on the eve of the Reformation. Life as a later Lollard was dangerous, forcing lollardy underground, and though Lollard numbers may have been numerous, their reliance on old arguments and doctrine facilitated a moribund tradition lacking spiritual volition. Thanks to the miracle of the printing press, English reformers provided old school heretics with newer English Bibles-a act the later Lollards would welcomed since the new reformers and their ideas on image worship, pilgrimage and clerical endowments were similar to their own (Aston 1984:239). The later Lollards were most likely assimilated as conforming members of the Reformed Church of England. Some Lollards may have joined more radical new dissident sixteenth century groups such as the Anabaptists or the Family of Love (Rex 2002:140). Theological similarities between Lollardy and Radical Reformation, such as an aversion to oaths, anti-formalism, and a dislike for complex doctrines, such as predestination, suggests that if there is any merit to Lollardy's continuity, it would be found in 'radical' rather than 'magisterial' Reformation (Rex 2002:141). Another possibility is that the Lollards of Chesham district did not assimilate, but remained distinct and eventually evolved into the seventeenth century Baptists and Quakers (Summers 1906:182). Another possibility is that Lollardy developed into Puritanism (Thomson 1965:253). As a postscript, the last Lollard was allegedly reported in 1893 by a Mr. Wentworth Webster, who in the year of 1850 met a respectable old woman and member of the Congregational church at Chalfont St. Giles, in Row Wood, between Chalfont St. Giles and Chenies. She claimed she was an Old Methodist and asserted that the reformed Church of England was a modern sect and that she belonged to a group that received the Gospel long before and that they were descendants of the old Lollards. The old woman had book dated from the eighteenth century about Lady Huntingdon's attempt to include Old or Primitive Methodists in Connexion. The sect apparently had a small chapel in Chalfont and in Amersham (a Lollard stronghold) which was more numerous in the counties bordering Wales. Old records indicated the existence of a peculiar sect at Chalfont St. Giles in the seventeenth and eighteenth centuries (Summers 1906:183-184). In summary, early Lollardy, inspired by the academic leadership of Wycliffe and doctrinal dissemination by the supportive gentry of the Lollard Knights, Lollardy spread mostly throughout the southern parts of England. The Lollard movement seemed poised for reformation. However, zealous persecution by the orthodoxy, the death of Wycliffe in 1384 and the 1414 botched Lollard rebellion, brought the growing movement to a standstill. Lollardy became synonymous with heresy and was driven underground. Being a Lollard was not only a difficult life, but also a dangerous one with aggressive prosecutions from both the orthodoxy and the Court. Lacking Wycliffe's intellectual leadership, the later Lollards neither copied old text or produced new manuscripts for the sake of recruiting and or retaining converts. And, with no further support from the Court, gentry or clerics, Lollardy, as an act of self-preservation, was forced to linger in secrecy, only betraying themselves accidentally by possessing vernacular writings or expressions of overtly excessive devotion. Furthermore, Lollardy lacked a cohesive network for maintaining fellowship and camaraderie. This lack of action and the Lollards nature for public conformity, essentially neutered the movement, leaving them to stagnate. Exploiting the invention of the printing press which made dissemination of heretical texts more numerous, the openly evangelical English Reformation movement arrived and thrived. Lollardy acquiesced, surrendering as a failed trial run at Church reform, the later Lollards readily conformed to the more agreeable Church of England and converged into the English Reformation. Somerset, Fiona, Havens, Jill C., and Pitard, Derrick G. eds.